Gordon Brown has said education and healthcare are his top domestic priorities, as he continues his bid to become the next Labour leader. The chancellor said he wanted "fairness and opportunity for all" in the UK, and for the health service to become "the envy of the world". Mr Brown spent his second day on the campaign trail with visits to marginal seats in Kent. He is so far unchallenged in his bid to succeed Tony Blair as leader. Mr Brown, speaking at Sunlight Community Centre in Gillingham, Kent, said: "My vision for the future of this country is that we have an even stronger economy, an even stronger society with a higher quality of life." He added: "It has been a privilege to serve under Tony Blair's leadership as prime minister of this country." He referred to his own experience of the NHS, when he was injured playing rugby and doctors saved his eyesight. "What I want for my children I want for every child, to get the best education and the best healthcare," he said. Mr Brown said there was a need for electronic prescriptions, the availability of blood pressure checks at pharmacies, and walk-in clinics. The chancellor said: "I see us building up the NHS and making it a great British institution and making it the envy of the world." Earlier, he told BBC Radio 4's Today programme that listening to people's views on the future of the healthcare system was an "immediate priority". Despite record investment in the NHS, the Conservatives were ahead of Labour in polls - which showed "we will - and have to - do better," Mr Brown said. Shadow Health Secretary Andrew Lansley questioned Mr Brown's history as chancellor when it came to NHS improvements. "Gordon Brown is responsible for Labour's financial mismanagement of the NHS. He failed to make the NHS a priority during his 10 years as chancellor and his rhetoric today is unconvincing," he said. 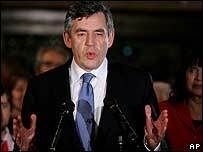 "The truth is that Gordon Brown is part of the past, not part of the future. It is the same old Labour, same old spin." A day after launching his campaign by saying he had the "new ideas and vision" to govern Britain, Mr Brown also spoke of other policy areas. He said he would be visiting Iraq again soon to "make my own assessment of the situation," but refused to outline any timetable for withdrawing British troops. "I don't think at this stage you pre-set a date," he said. British troops were moving to an "advisory position" as the emphasis shifted from security and military to political and economic development. He said military operations in Iraq and Afghanistan had cost about £6bn. Mr Brown is the firm favourite to succeed Mr Blair when he quits on 27 June. On Sunday Mr Brown will hold his first policy debate with his two party rivals - Michael Meacher and John McDonnell. The pair are yet to decide which of them will challenge Mr Brown, insisting that between them they can muster the support needed for one to go forward as a candidate. He will also be in East Sussex for the Brighton Festival. Mr Brown could still face a challenge from one of the two left-wing backbenchers, but there appears to be a coordinated effort among Labour MPs to unite behind him, with Blairite MPs Stephen Byers and Alan Milburn also expected to back him. Meanwhile, former US President Bill Clinton has described the leadership hopeful as "brilliant" and "authentic". Mr Clinton said they were attributes which "carried their own charisma".